The idea five years ago that the UK would embark on an ambitious generation of new nuclear power plants would have been unimaginable. Indeed, it looked like the nuclear age was over. 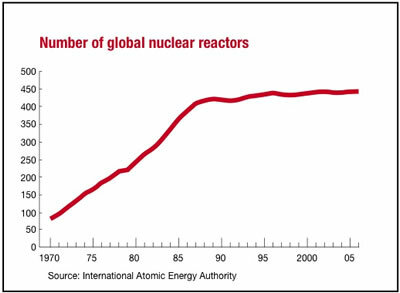 The accident at the Chernobyl reactor in 1986 all but halted the development of nuclear power stations for the next decade and a half whilst the global growth of operational plants has been virtually static since the late 1980s (see chart). But now the UK, like many other countries, is grappling with the twin challenges of reducing carbon emissions and increasing the security of energy supply. Moreover, with oil well over $100/barrel, and tipped by some to be set for $200/barrel, the economic balance has shifted and the UK Government is determined to deal with the twin challenges robustly and effectively. The global landscape is changing, with over 30 countries considering new build programmes. The scale of this global nuclear renaissance can be seen by looking at the number of power stations under consideration: current figures suggest that there are more than 250 nuclear power plants around the world being built or planned (see chart) compared to the increase of just 26 between 1990 and 2006. In January, the British government unveiled a new, if widely-trailed policy of supporting a new generation of nuclear reactors. Industry has welcomed the decision, but the green lobby condemned it outright. Government support is certainly very welcome (indeed it is a requirement) for those looking to invest in new nuclear in the UK given the increase in global interest of new nuclear. But are these ambitions deliverable? Unlike other countries, the UK is not taking a state-led approach. In the US, the Energy Policy Act 2005 provides a number of support mechanisms to allow the risks associated with nuclear power to be shared across the public and private sector, greatly enhancing its commercial attractiveness. In many other countries, the state is providing a significant amount of the funding or owns the entity responsible for building and operating the plant. In the UK, government policy is that the private sector should make investment decisions on generation projects independently of government and this is to apply equally to new nuclear. The history of governments picking winners does not recommend itself as a good way to do business. Hence, the private sector will be expected to bear all commercial risks without government intervention. For this to work in the nuclear context – where new investors will need to be able to fund very considerable capital expenditure, in a sector that has been prone to cost overruns and delay – the framework needs to be clear and robust. Government, therefore, has taken the lead to ensure that the risks that they influence – and there are a number – are well controlled. The January announcement included a number of measures that sought to give confidence to industry. The UK nuclear market is currently dominated by British Energy. But the country’s existing nuclear fleet is ageing with around two thirds of capacity coming to an end by the end of the next decade. This, combined with 10GW of coal and oil capacity expiring by 2020, imposes a real deadline. Unless new nuclear gets underway very soon, it may defer the UK’s contributions to reducing CO2 emissions and worse still materially weaken the UK’s security of supply as pressure to close the gap between the UK’s energy’s needs and generation increases and the temptation will be to go for a second “dash for gas” - which will solve neither problem but exacerbate both. Nonetheless, British Energy’s dominant position in the market puts them in a very strong position to play a major role in new generation as they have some of the most suitable sites for new stations. This is because local public acceptance is a key factor and local communities are both used to living with a nuclear power station and also often sharing in the economic benefits they confer. But the UK’s Nuclear Decommissioning Authority also has a number of sites that could be suitable for new reactors. But neither of these parties – British Energy or the NDA – is in a position to develop new generation capacity without a partner – both lack the financial muscle, development expertise or the necessary off-take capacity to go it alone and of course the NDA’s mission is utterly different to new nuclear build. Both will need development partners or outright owners of their sites and there are a number of major utilities potentially interested (EdF, Eon and RWE are the most commonly cited but many others are particularly active). However, the framework needs to be right so that it can work effectively commercially. There is no doubt that utilities are very interested in participating in new nuclear as means to diversify their energy mix and reduce carbon emissions. However, this is not at any price - new nuclear needs to be commercially attractive compared to other means of generation. A process is already underway to allow private sector organisations interested in building new nuclear generation capacity to buy suitable NDA sites. This, together with the current interest in potential acquisition of part or all of British Energy should ensure that by the end of 2008 there could be 2 organisations aiming to develop new nuclear generation facilities. However, the economics of nuclear are heavily dominated by high capital costs; once operational, fuel, operations and maintenance costs are comparatively low. This means that the economics of nuclear are very exposed to construction overruns and delay. It is absolutely key to mitigate risks so that projects are delivered on time and on budget. Opponents of nuclear point out that delays and cost overruns are endemic to nuclear construction programmes. (Sizewell B took 15 years to complete from the original application; the delays added hugely to its costs). Against the risks of capital cost overrun are the prospects of an effective carbon price – which is a clear and urgent policy in Brussels and which, once implemented properly, will have the effect of placing a floor price on the cost of electricity. Clearly, the higher the price attributed to carbon emissions, the more attractive nuclear and renewables look by comparison. Operators are looking to the development of the EU Emissions Trading System (ETS) into a robust market so that a price for carbon emerges that will be high enough to make nuclear even more viable. Industry has called for clarity on the long-term cost of carbon. The government is committed to this, and is fully focused on and supportive of the ETS as the fundamental route for driving the behaviour change needed to deal effectively with climate change. If we assume that, prima facie, there is an economic case for investing in nuclear, what needs to be done to secure the necessary finance? 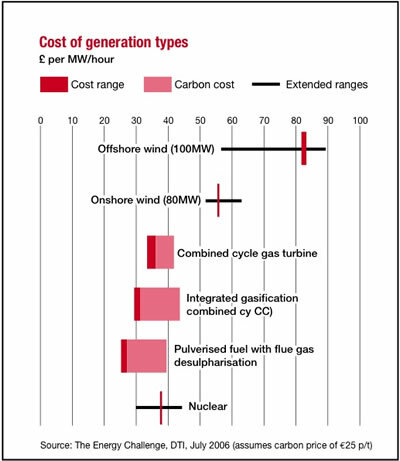 It is widely recognised that building significant new nuclear capacity is going to be capital intensive: replacing only the 10GW of nuclear capacity that expires by 2023 will itself cost between £12 billion and £15 billion. Essentially, the risks that need to be managed fall into two broad categories: those that the private sector should manage and those that Government needs to manage. Into the first category fall: construction, commissioning and price as the main risks. The main risks that government has to manage are: political/policy, planning, regulatory/licensing, waste and decommissioning and the carbon price. On planning, the government has set out the proposals to assess the suitability of sites proposed by operators. . Combined with a new Planning Bill that will institute a national planning body that has the power to take national decisions on important infrastructure projects (such as energy generation), this should go a long way towards mitigating the planning risk. Both should conclude in 2009/2010, which would still allow ample time for financing to be put in place for the next generation of nuclear. On waste and decommissioning, the Energy Bill, currently going through Parliament will create a robust mechanism for ensuring that more than adequate funds are set aside to pay for the disposal of the waste generated and the decommissioning of the nuclear reactors at the end of their lives. This has added further comfort that new nuclear can be economically attractive and that the risks involved in the operation, waste disposal and decommissioning can and will be sensibly dealt with and at the same time ensuring that risks do not revert to the taxpayer. New build participants recognise that they will have to bear the costs of waste and decommissioning liabilities but neither they nor their finance providers want to be exposed to a significant increase in these costs. The government is proposing to require these costs to be covered through the mandatory payment of contributions from operators over the lifetime of the plants into robustly protected independent funds – and the operation of a nuclear plant outside a properly approved waste and decommissioning plan will be a criminal offence. The government is addressing regulatory and licensing risk in two ways. First, there is a generic design assessment process whereby reactor designs are pre-approved for use in the UK. As part of this, the nuclear regulators are working ever more closely with their counterparts around the work to ensure that knowledge is shared and leveraged and that never again are bespoke reactors constructed. Secondly, a review is underway of the regulatory regime to ensure that it is fit for purpose for the new era of new nuclear build. So, given all of the above – how hard will it be to raise money for new nuclear projects? There are two options; firstly new build could be funded solely from the balance sheet of the major utilities. This is likely to be the strategy of the major utilities. The second option is some form of limited recourse finance, which could possibly be achievable in the medium term with credit-worthy off-takers. The challenge will be just who will enter into long-term contracts; arguably with fossil fuel costs likely to outstrip normal inflation by a very significant margin, there is a strong economic case for locking in long-run electricity costs sooner rather than later. Over the past 15 years the project finance market has developed to cover a range of challenging risk profiles and has shown itself to be sufficiently innovative to meet the needs of investors. The quantum of finance required, together with the challenges and sensitivities that accompany nuclear, means that a range of finance providers is likely to be required: lending banks could be a major source of finance but so too could the capital markets; export credit agencies and the regional investment banks. If technology providers can bring financing to the table, that could be valuable too and, perhaps, an important additional validation of their technology. The second issue that will be important to lending banks – and to utilities as well – is the public perception of nuclear. At the moment the public appears to be increasingly recognising that nuclear has an important part to play in the future generation mix. This is where government has an important role – both in terms of making the public case for nuclear and for showing that the long term waste issue is well under control. At the moment, public opinion appears to be divided, KPMG’s 2007 YouGov poll showed that those in favour has steadily increased over the past three years from 29% to 38% so that those in favour is now equal to those who oppose. This is encouraging, and as realisation of the importance of security of supply and climate change issues continues to increase, so will the support for new nuclear power as an important part of the generating mix. 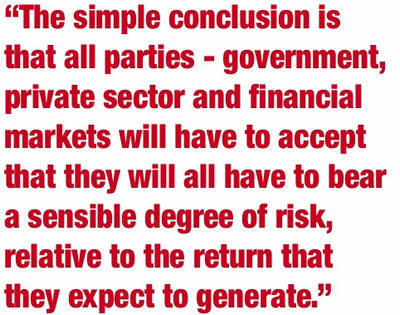 The simple conclusion is that all parties - government, private sector and financial markets will have to accept that they will all have to bear a sensible degree of risk, relative to the return that they expect to generate. If Britain is to get a new fleet of nuclear power stations within a sensible timescale the overall economics appear to be very promising indeed and a very good bargain all round. Meanwhile, the Government is determined to make the UK the best place globally to do new nuclear business and has made very significant progress with a number of leading companies placing the UK in the top three countries in which they are focusing their efforts. The dawn of the new nuclear era has been likened by the Secretary of State for Business and Enterprise as being as promising as the dawn of North Sea oil. The re-emergence of nuclear power will could turn out to be one of the largest single changes in post-industrial Britain. Tim Stone is Chairman of a leading Global Infrastructure practice and is advising the Secretary of State for BERR and the Chief Secretary to the Treasury on new nuclear matters.